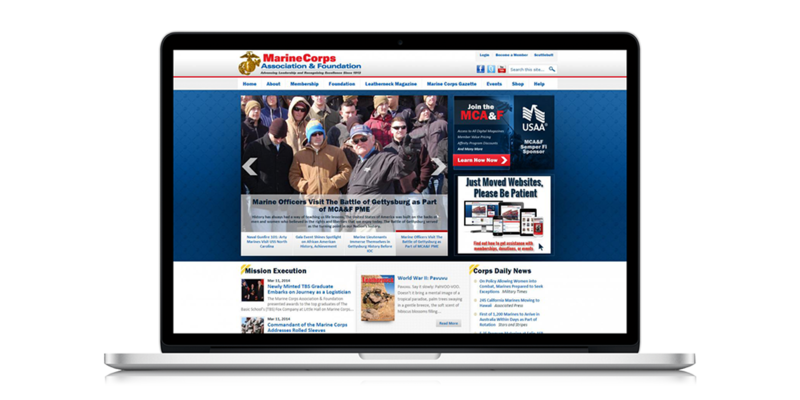 The Marine Corps Association and Foundation operates multiple web presences with sites dedicated to the association and its two publications, Leatherneck and The Marine Corps Gazette. The multiple web presences posed several challenges for the MCA&F. The first major challenge was that each site had its own specific branding so that members were confused as to whether or not they were associated. The MCA’s main site and each publication had their own look and feel and members had to learn how to work within each site in order to locate the information they sought. Accessing the wealth of content available in the print edition of the magazines was challenging on each site as there was no repository for members to find articles and no easy way to display the magazine online. Articles were manually copied from the Adobe InDesign print file and posted as a PDF online. This time consuming process limited the number of articles that could be viewed online and the depth with which members could interact with those article. In addition to the incongruous branding and user experience, the staff at MCA&F and the publications were not in alignment with regard to the maintenance and growth of each of the web presences and would continually duplicate efforts to improve their individual site. MCA&F turned to Unleashed Technologies to address the inconsistencies across the sites, limited user engagement, challenging user experience, and manual effort required to update and maintain the site. Import of every article back to the mid-1910s with the ability to read each issue of an MCA&F publication front to back and search by issue or category. The ability to offer content, such as articles, videos, additional author information, etc..., related to the article a member is reading. Intuitive user experience with access to all web presences from the main navigation and a streamlined membership purchasing process so that what formerly was a several page process is reduced to one page. Integration into the IMPak Association Management System so that membership, donation, and event registration information that is submitted through the website is also updated in IMPak. User information is synchronized across both systems, ensuring accuracy and saving members and staff time and frustration. 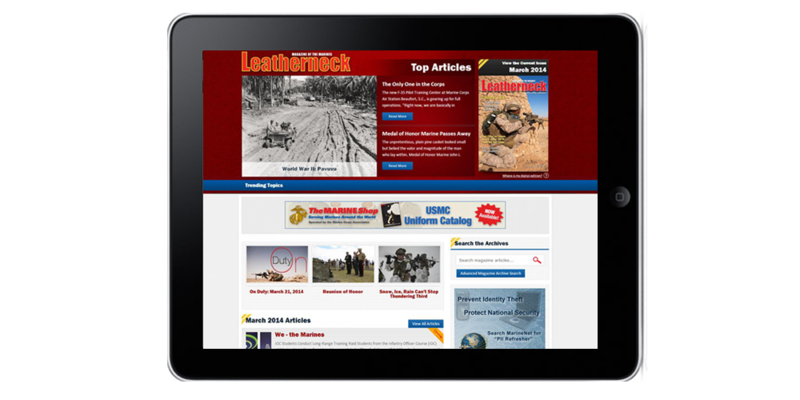 Mobile access to publications with search, login and remember me functionality so that members can access their favorite magazine’s content from wherever they are. Quickly find information they’re looking for with intuitive navigation and design across all sites, powerful search, and a comprehensive archive that delivers all issues of the MCA’s publications online. Access articles from wherever they are, however they want to. 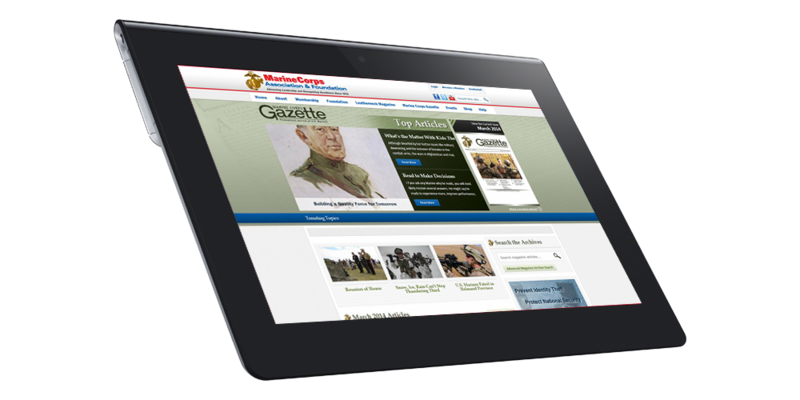 MCA’s publications are now available in an easy-to-use online format with mobile access (via smartphone or tablet) so that even deployed units can easily access published content. Engage with MCA&F in more ways with a range of social sharing options and Scuttlebutt, a multi-media page that aggregates all social media outlets where MCA has a presence. 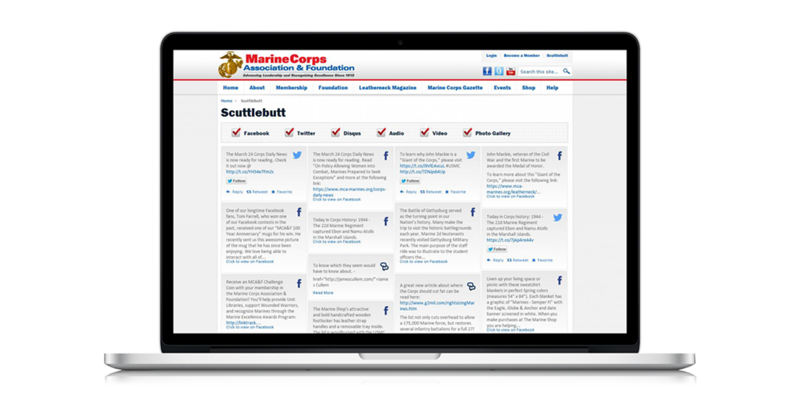 Scuttlebutt presents the latest news, pictures, videos and more from one central page so that members and online visitors can stay up to date with the latest content without leaving the site. In addition to the benefits for members, the integrations into IMPak and an automated XML importer that translates print files into web content mean that the team at MCA&F can now devote more time to fulfilling the organization’s mission and less time performing manual updates to the site and its databases. The new MCA&F website has unified the three formerly distinct web presences to ensure that the look and feel, navigation and access to information and content is intuitive for all visitors. The enhancements and upgrades help the organization to fulfill its mission by driving more value for members and helping to spread awareness of the rich traditions, history, and esprit of the United States Marine Corps. Unleashed Technologies had a plan for integrating all of our legacy systems, which was a holy grail for us. We always saw this as a goal for the distant future because there hadn't been a company that could do this for us. After a year of working with them, we were able to deploy our unified sign-on. Our members can log in and go from one site to another, being logged-on automatically. It sounds simple in the frontend, but it was a complete nightmare in the backend.